Creating opportunities for your child to learn about food and cooking is the start to fostering a happy and healthy relationship they’ll have with eating. Join us for our new #KidsWhoEat series, where we share tips and resources on how to nurture better eaters. We recently released our first ever calendar and it is the perfect way for us to kick off our newest series, #KidsWhoEat. This series is going to be about helping your kids appreciate and try new foods, and we’ve got some great tips and resources coming your way. Be sure to sign up for our newsletter below so that you can receive all this info in your inbox first. Teaching kids about food and having them help out in the kitchen is a big way for kids to get involved and appreciate food and health. Learning about foods gives them a better understanding of the food that is on their plates – where it came from, how it was cooked, etc. Our calendar is a great tool that can help kids learn more about food and cooking because it is filled with our most popular and helpful infographics. Not only is it an awesome thing to hang in the kitchen or even a classroom, it’s something that is useful that you and your kids can learn from every single month. This 16-month calendar is on sale now at Amazon, Barnes and Noble, and Calendars.com. You can buy it now and it’ll still be useful, because it has the last four months of 2016, and then you can kick off 2017 with lots of great cooking info. Whether your kid is in elementary school, middle school, or high school, this calendar is such a fun learning tool. Teachers can also use this in their classroom, so if you know of any teachers who could use a colorful resource to enhance their lessons, this calendar is a great bet. As we mentioned, this calendar contains our best infographics, but there is only so much space to fill on a calendar, which is why we’re going to walk you through each month of the calendar – so you know what useful infographics come in the calendar – as well as provide you the links to download the complete resource for free, so that you can learn even more about each topic. Finish off the rest of this year with this fun Flavor Profiles infographic. We all eat and we all taste things, but we may not exactly know why we enjoy the tastes that we do, and when we season, we don’t always know what will make it taste better. This infographic breaks down 5 flavor profiles and the ingredients you can use to enhance your meals. Most likely, you’ll have all the condiments and ingredients in your pantry. Use this infographic to learn how to season and flavor your meals without relying solely on salt and pepper. Kid’s Food Exercise: Let kids taste the individual ingredients, and then the finished dish after cooking. Ask them how those ingredients changed and how they enhanced the taste of the dish. Use the infographic to broaden your horizon about seasoning and learn more about flavor profiles. Create perfectly balanced and flavorful culinary masterpieces. Get it in your inbox, and create perfectly balanced and flavorful culinary masterpieces! While this might not be an infographic that elementary school students would be interested in, it’s still good for them to understand ways that food waste can be reduced. One of those ways is to properly store food in the freezer, so we know how long the foods last and what foods can be stored in the freezer to last longer. Get the full lesson on freezing here – it even includes how to blanch certain foods to make them freezer-friendly. Kid’s Food Exercise: Even if the younger kids aren’t into learning about frozen food storage, you can still get them to help by portioning sauces into ice trays or measuring serving-size ingredients into bags and labeling them for easy access and quick thawing. If you’ve been cooking for awhile now, you probably start off a dish with onions, garlic, and other ingredients with lots of fragrance and aroma. Aromatics are the base of each dish, and this infographic goes through ethnic cuisines and the different types of aromatics you would use in those cuisines. Like the Flavor Profiles infographic, this is all good, basic cooking knowledge that can help you become a better cook. Kid’s Food Exercise: Have kids smell and identify different aromatics. This is also a great time to introduce your kids to a variety of ethnic dishes. If kids are old enough, teach them how to prep aromatics with the help of our short prepping and cooking videos. 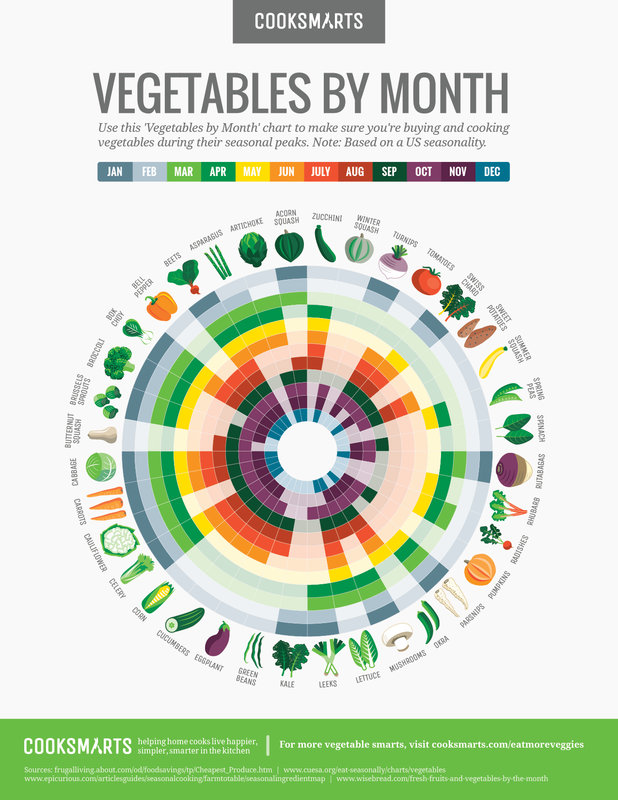 This infographic goes through different vegetables by month and when they’re in season. They’re color coded from January to December, so that you can easily see which veggies are in season and when. The one in the calendar is the US version, but because we now have so many readers who are from Australia, we also came out with an Australian version recently, which you can download for free below. Kid’s Food Exercise: Throughout the seasons, make sure you buy veggies that are in season, so that you and your family can taste when the veggies are at their peak. You can also supplement this lesson by taking your kids on a field trip to the local Farmers Market, so they can see the veggies that are currently in season. For Our Friends in the Southern Hemisphere. Veggies By the Month: enjoy them at their peak. 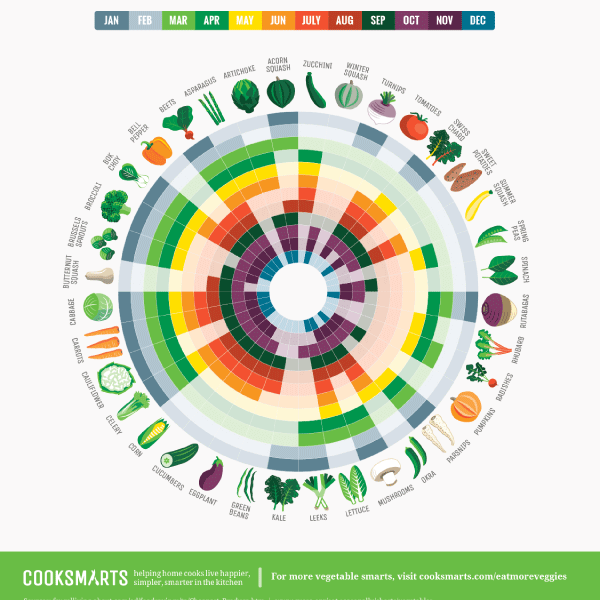 Buy and cook veggies that are at their best tasting with the help of this Vegetables by Month Chart. Are you someone who has a messy spice drawer? Or maybe you’ve accumulated so many jars and bags of spices, you don’t even know what you have anymore? This infographic is useful because it allows you to see what spices you have and need to use, and it tells you the different proteins, vegetables, and entrees you can use specific spices on, as well as spice pairings. Kid’s Food Exercise: When you’re cooking a certain vegetable or protein, or a kind of dish like soup or salad, have your kid go through the infographic and choose a spice that will go well with whatever you’re cooking. It lets them have a say in the cooking process, and gives them more incentive to try new spices. Make sure they smell the spices first so they can appreciate foods with more of their senses! 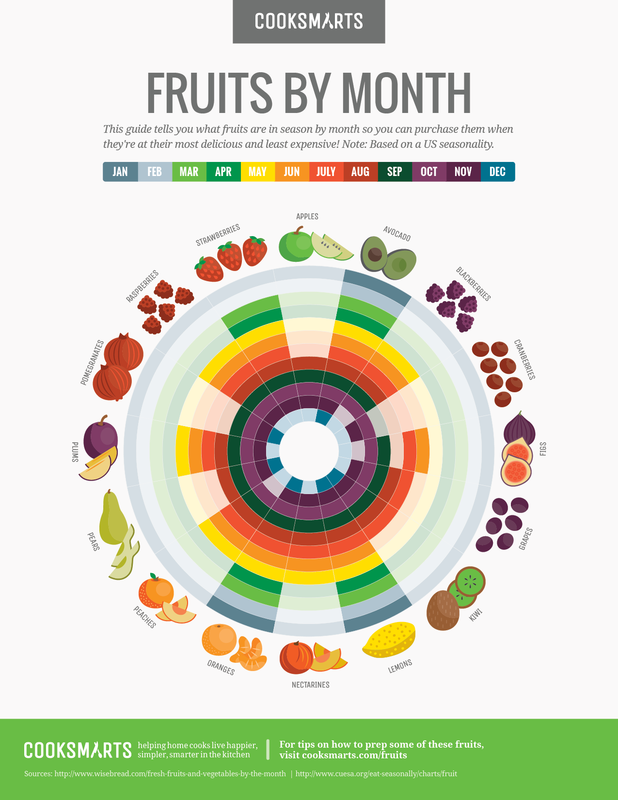 This Fruits by Month chart is similar to the Vegetables by Month chart, except with fruits. We want you to enjoy the sweetest, juiciest, most refreshing fruits, which means buying them when they’re in season. 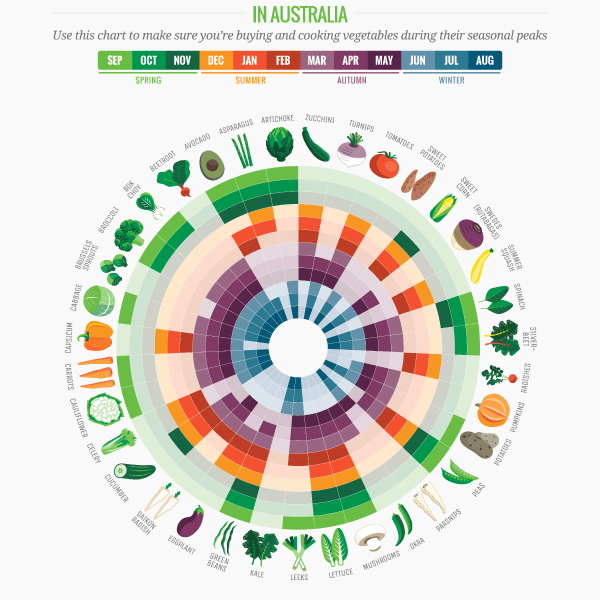 And like the veggies chart, we have an Australian version, in addition to a US version, that you can download for free. Kid’s Food Exercise: Take your kid to the grocery store and let them pick out the fruits. The challenge is that they have to pick whatever is in season! Fruits by Month Guide: enjoy fresh fruit in their seasonal peak. 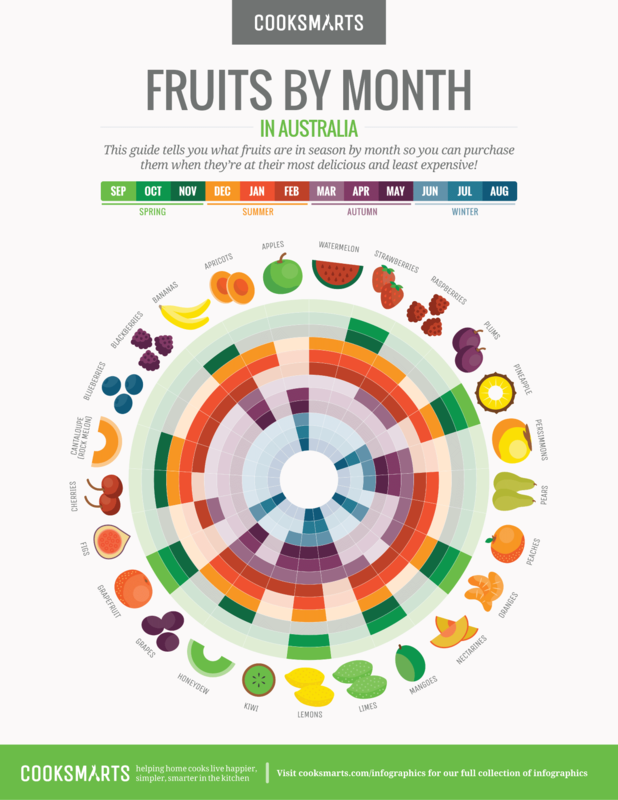 Buy fruits at their most delicious and least expensive with this Fruits by Month Chart. This Fresh Herbs infographic is similar in layout to the Spices infographic. We cover a bunch of herbs and what they go well with – veggies, proteins, and the dishes they can be used in. We know that a lot of folks are a little afraid of herbs since they spoil easily, or they don’t know what to do with them after they’ve used just a bit for one dish. This infographic teaches how to store herbs properly, so you don’t have to worry about them spoiling so quickly and easily. Kid’s Food Exercise: Get creative with cooking! Go through the guide and have your kid pick out an herb they want to try, and then a corresponding vegetable, meat, or dish to use with the herb. And of course, let them “plant” the leftover herbs so that they last longer. Also, consider growing a small herb garden with your child! Add flavor and freshness to your cooking. Learn about cooking with fresh herbs and properly store them. We have a much more extensive guide below with 20 burger combo ideas, but for the calendar, we kept it simple enough to give you some fun ideas for burgers. 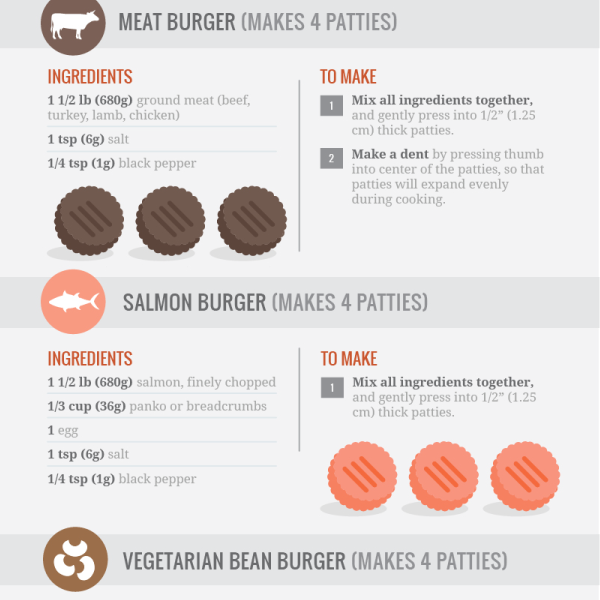 This infographic provides the basics, but also includes ways on how to jazz up burgers, so that you can have a very fun barbecue. Kid’s Food Exercise: Put together a burger bar with your kids by setting out different toppings. 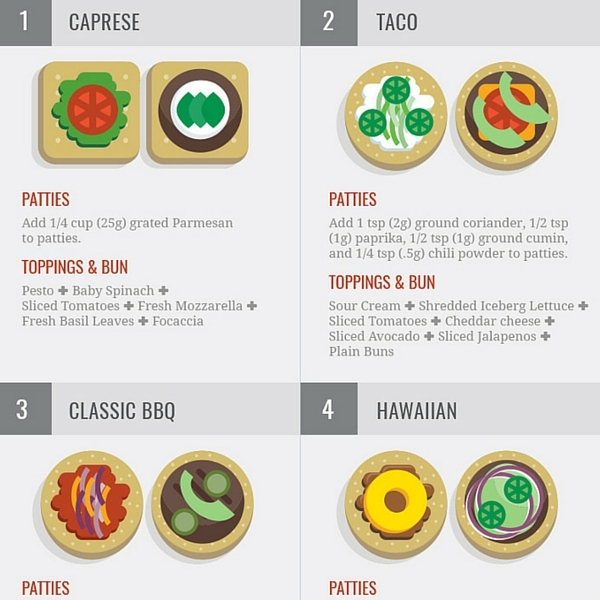 Each person can customize their own burger, and we’re pretty sure your kids will come up with some very creative combos that are not in our guide! We know that a lot of people struggle with how to cook vegetables, so we came up with this infographic to show the different ways you can cook them. When we created this infographic, we also put together a library of our produce prep videos to make it even easier for you to prep and cook veggies. Check out our Produce Prep Guide here to get access to all our prep videos. Kid’s Food Exercise: It’s always such great help when kids can help with the chopping. Younger kids can help tear greens or use scissors, but it’s best to start with easy-to-chop ingredients, like zucchini and eggplant. Regardless of age, teach them our basic knife skills to promote safety. You can also take your kids on a field trip to your local Farmers Market with this infographic on a tote bag! They’ll be able to easily identify all the veggies that are currently in season. Get this tote bag from our Shop here. One of our big missions at Cook Smarts is not only to teach people how to cook, but also how to reduce food waste, and many times, a lot of food is wasted because of leftovers. We know that people don’t necessarily love eating leftovers, so we show you different ways to turn leftovers into something completely new. This infographic is all about repurposing leftovers so you feel like you have a new dish versus leftovers. Kid’s Food Exercise: Let your kids choose how they want to repurpose their leftovers, and have them help make the new dish. They might not be enthusiastic to see leftovers, but when they can transform yesterday’s leftover veggies into tacos or pizza, they’ll totally be game. This infographic is similar to the spice infographic from earlier, but we focus on spice blends here. We cover 8 different ethnic spice blends – what’s in them and how to use them. Kid’s Food Exercise: This infographic makes for a good geography lesson. Talk about what areas of the world these spice blends are from. Let them smell the blends and see if they can identify the different spices that make up the blend. We know that some people feel like they have exploding pantries and don’t know what to do with all the ingredients they have in there. This infographic shows all the basic pantry items you need to cook a quick, healthy meal any time. If you follow a specific diet – gluten-free, paleo, or vegetarian – we’ve also put together guides for each of these diets. You can download them for free and get a more extensive look at all the pantry basics here. Kid’s Food Exercise: Whenever you don’t have time to run to the grocery store, enlist your kid to help you come up with a meal using what’s in your pantry. You can also teach them how to be organized in the kitchen for more efficient cooking by organizing the pantry with them. Keep your pantry stocked with these basics, so you'll never be far from a simple, healthy meal. Pantry Essentials Guide: never be far from a simple, healthy meal. Stir-frying is such an easy, quick, and healthy cooking method, and this infographic teaches you the basics of stir-frying and how you can take anything in your fridge and turn them into a delicious stir-fry. You’ll never have to order take-out again! Kid’s Food Exercise: Let your kid make the stir-fry sauce and have them come up with a stir-fry combo every week by using what’s in the pantry and fridge. This is a great way to put into practice the previous lessons, like repurposing leftovers and pantry essentials. This guide to stir-frying teaches the basics of this quick and healthy cooking method. Get 26 stir-fry combo ideas and make quick, and healthy meals. And there you have it! 13 cooking infographics to help you and your kids cook smarter, simpler, and healthier. This info will be valuable for the long run, so when you buy this calendar, we suggest keeping the pages to use as a resource beyond 2017. For your kids to extend their cooking knowledge outside home, you can buy this calendar for your kid to bring to school as a gift for the teacher, so that the teacher can use the calendar to incorporate fun cooking and food lessons in class. Over the next few weeks, we’ll be sharing tips on how you can raise your kids to become healthy eaters and appreciate food, health, and dinnertime. Be the first to get access to all our new cooking tips and resources by signing up for our newsletter below. Just be sure to sign up before Saturday, 10/8!